North Korea’s deployment of a new road-mobile missile that can hit the United States prompted the Pentagon on Friday to add more ground-based anti-missile interceptors to bases in Alaska and California, senior defense and military officials said on Friday. Adm. James Winnefeld, vice chairman of the Joint Chiefs of Staff, told reporters at the Pentagon that North Korea’s new, road-mobile KN-08 ICBM has emerged as a threat "a little bit faster than we expected." "We believe the KN-08 probably does have the range to reach the United States, and our assessment of where it exists and its lifetime is something that would remain classified," Winnefeld said. Director of National Intelligence James Clapper told the Senate Intelligence Committee on Tuesday that "we believe North Korea has already taken initial steps towards fielding this [KN-08] system, although it remains untested." Winnefeld also warned North Korea the United States is prepared to take military action if deterrence fails and Pyongyang should attack. "We not only intend to put the mechanics in place to deny any potential North Korean objectives to launch a missile to the United States, but also to impose costs upon them if they do," he said. "And we believe that this young lad ought to be deterred by that, and if he's not, we'll be ready," he said, referring to North Korea’s 29-year-old leader Kim Jong Un. Winnefeld said the KN-08 was first displayed during a military parade in Pyongyang last April and produced mixed assessments of whether the six missiles on a Chinese-made mobile transporter erector launcher were real or fake. "We’ve also seen their nuclear test recently," he said. "Obviously without getting into intelligence aspects, we watch this evolving threat very, very closely." 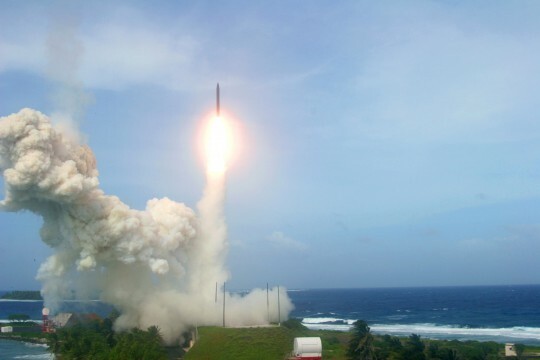 Miller noted that the Taepodong-2 long-range missile test in December was an additional concern that played into the missile defense upgrades. Defense Secretary Chuck Hagel announced the new long-range interceptor deployments as part of four steps being taken in response to North Korea’s latest nuclear test Feb. 12 and the recent rollout of the KN-08 road-mobile missile that intelligence officials said this week is becoming operational even though it has not been flight tested. The Taepodong-2 rocket that launched a satellite recently also highlights the long-range missile threat, he said. "The United States has missile defense systems in place to protect us from limited ICBM attacks, but North Korea in particular has recently made advances in its capabilities and is engaged in a series of irresponsible and reckless provocations," Hagel said. Canceling deployment in 2022 of an advanced and more capable version of the Navy SM-3 missile called variant IIB for use against Iranian long-range-missiles. The program was cut to save money. Hagel said the SM-3 IIB had been delayed by budget cuts until at least 2022 and with growing Iranian and North Korean missile threats, funding will be added for the 14 Ground-based Interceptors (GBIs) and advanced kill vehicle for it. "By taking the steps I've outlined today, we will strengthen our homeland defense, maintain our commitments to our allies and partners, and make clear to the world that the United States stands firm against aggression," he said. The new GBIs would be in place by the end of 2016, he said. James Miller, undersecretary of defense for policy, who appeared with Hagel, said China was informed of the new missile defense steps but he declined to say how they reacted. Beijing in the past has opposed all U.S. missile defenses in Asia as potentially countering China’s large and growing missile forces. China is currently deploying at least three new strategic missiles and a new medium-range conventional missile capable of hitting U.S. aircraft carrier at sea. Miller said the Pentagon is going ahead with its European Phased Adaptive Approach but dropping the fourth phase in favor of a faster third phase to save money. "We will still go forward as planned with phases 1 through 3," he said. Phase 3 calls for deploying 24 more advanced SM-3 IIA interceptors to be deployed in Poland by 2018. Phase 4 called for deploying the more capable SM-IIB by 2020. Winnefeld said the additional GBIs and a possible third GBI on the East Coast would cover both Europe and the United States from missile threats that would have been countered by the SM-3 IIB. "So by doing what we're announcing today, we're going to get better defense of the United States, more fulsome coverage of the United States, and we're going to get it a lot sooner," Winnefeld said. The second radar in Japan will be deployed at the Japanese Ground Self-Defense Forces’ base near Kyotango. The base is about 65 miles northeast of the ancient capital of Kyoto. The TPY-2 system is based on a high-resolution, phased-array X-band radar to detect missiles shortly after launch. The data is then transferred to missile-defense interceptor systems based on the ground or on Aegis ships carrying interceptor missiles. Winnefeld said the military currently has about five Aegis-equipped missile defense ships in the Pacific. Asked about China’s reaction to the new deployments, Miller said: "I won't predict that. I hope that they understand that we need to take the steps necessary to defend ourselves against potential emerging threats from Iran and North Korea. It's our policy to stay ahead of those threats, and we're taking prudent measures to ensure we do so." ‪The Pentagon announcement drew a mixed response from Sen. James Inhofe (R., Okla.), ranking member of the Senate Armed Services Committee. "Secretary Hagel’s announcement is a step in the right direction but does not go far enough to address the threat from Iran which, according to the Department of Defense, could test an Intercontinental ballistic missile as early as 2015," he said. Rep. Mike Rogers (R-Ala.), chairman of the House Armed Services subcommittee on strategic forces, said the missile defense interceptor deployment was welcome news. "The Obama administration’s decision to deploy more interceptors for the national missile defense system is welcome news after four years of devastating missile defense cuts by this administration," Rogers said. Rogers said the administration four years ago "began to unilaterally disarm our defenses and deterrent in the hope our enemies would follow suit." "But hope is not a defense strategy,"Rogers said in a statement. "President Obama is finally realizing what President Reagan taught us 30 years ago. The best way to keep the peace is through strength." Sen. Bob Corker (R-Tenn.), ranking member of the Senate Armed Services Committee, questioned the decision to change the European missle defense plan. "I call on the administration to go further and reposition available resources and expedite consideration for an East Coast missile defense site to ensure a more robust protection against the very real threat of ICBMs," Corker said in a statement. This entry was posted in Politics and tagged Chuck Hagel, James Clapper, Jim Inhofe, Missile Defense, North Korea, Nuclear Weapons. Bookmark the permalink.